PIKE COUNTY, Ohio -- January 16, 2019 -- Applications are now being accepted for the Fluor-BWXT Portsmouth (FBP) STEM Scholarship program - open to all 2019 graduating seniors attending a high school in Jackson, Pike, Ross and Scioto counties. In total, twelve $2,000 scholarships will be awarded to local qualifying students pursuing STEM-related majors at an accredited university. 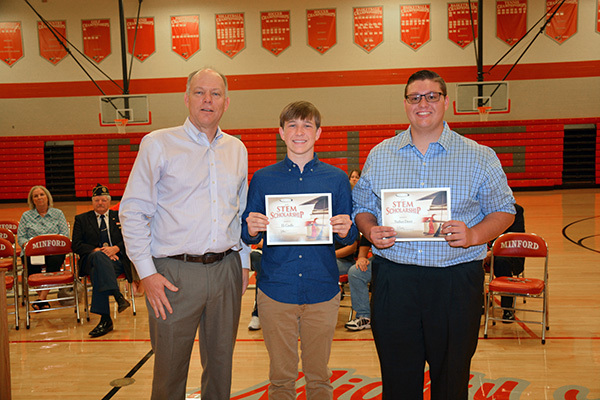 Eli Cordle and Nathan Dever, Minford High School, were two of last year’s Fluor-BWXT STEM Scholarship recipients. From left, Fluor-BWXT Site Project Director Bob Smith, Cordle and Dever. Fluor-BWXT is committed to being an active corporate leader in the communities that have supported nuclear and environmental remediation missions at the DOE’s Portsmouth site for more than 50 years. Fluor-BWXT creates opportunities for area students to excel in STEM-related studies and careers. Since 2011, FBP has awarded more than $425,000 in scholarships to graduating seniors in the four-county region. For detailed application information, visit www.fbportsmouth.com/community/scholarship.htm or contact Deneen Garner at 740-897-2609. Fluor Corporation (NYSE: FLR) and BWX Technologies, Inc. (BWXT) (NYSE: BWXT), two world-class companies with significant Ohio experience, formed Fluor-BWXT Portsmouth LLC (FBP) to address the decontamination and decommissioning (D&D) needs at the Department of Energy's (DOE) Portsmouth Site in Pike County, Ohio. CH2M, another global leader in industrial and environmental projects, provides support. Fluor-BWXT employs 1,800 workers who bring unparalleled experience, insights, and lessons learned from across the DOE complex. The Fluor-BWXT Portsmouth mandate is to clean up the Portsmouth Site safely and compliantly, provide strong uranium stewardship and partner with local communities to achieve a sustainable economic future. For more information, visit www.fbportsmouth.com.